The Jezebel spirit is so evil that in the Book of Revelation God warns us about the consequences of hosting or tolerating this demon in the church. To understand this spirit, we need to look at the physical example we have of the person from whom the spiritual principality gets her name. In 1st Kings, Jezebel is a wicked pagan queen who worshipped Baal. She was married to King Ahab and manipulated him to bow down to and worship other gods. She committed murder to please her husband with Naboth’s vineyard and she threatened to kill the prophet Elijah. Her intimidation tactics are ruthless when she is angry. This is the same spirit that was in Herodias, the wife of King Herod, and her daughter Salome who danced around the King to seduce him, then asked him for the head of John the baptist. Jezebel hates the prophets. 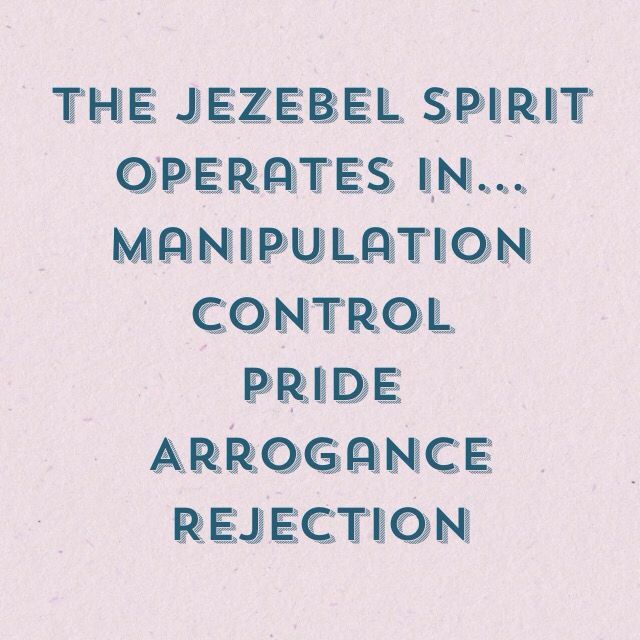 Jezebel will always disguise herself as someone spiritual, a false prophet or a seer who has a counterfeit Holy Spirit. 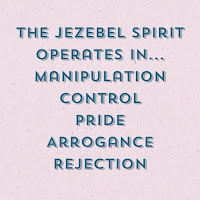 Often someone who has a Jezebel spirit will manipulate their way onto the worship team, or into a leadership position in the church, where she wreaks havoc in every area of the church. The goal of this spirit is to always move up in the church to get as close to the pastor as possible. As it is moving into position if anyone gets in its way, this spirit will attempt to destroy them, their relationships, marriages and/or businesses. By the time people realize what’s going on, it can be too late, the damage has been done and it can take years to pick up the pieces and mend the brokenness that Jezebel has caused. Abusive, controlling personality pastors most likely have this spirit. Never seen getting his hands dirty, because ‘he is the pastor,’, (This arrogant attitude is another sign of Jezebel which works hand in hand also with the religious spirit). Jezebel’s purpose is to stop a move of God that brings in a true revival: to stop the Glory of God from entering the church. Over the years we have heard of revival breaking out in churches. Have you ever wondered why it stopped? Jezebel most likely walked in unnoticed by the leadership and her presence and actions pushes out the true presence of God. I have seen first hand how Christians are slow to realize they are noticing something is not right but are afraid to speak up and say anything bad. Many in church do not know how to sound the trumpet on what they are discerning. The problem is the church does not teach on discernment and how to know when the Holy Spirit is showing them something. We’ve all been there, where we don’t want to say anything negative about a person for fear that we are the one that has a ‘heart attitude problem’ or fear that they will label us as the trouble maker. It’s good to know where God is at work in our lives and in the church, but we must know how to discern also where the enemy is at work. 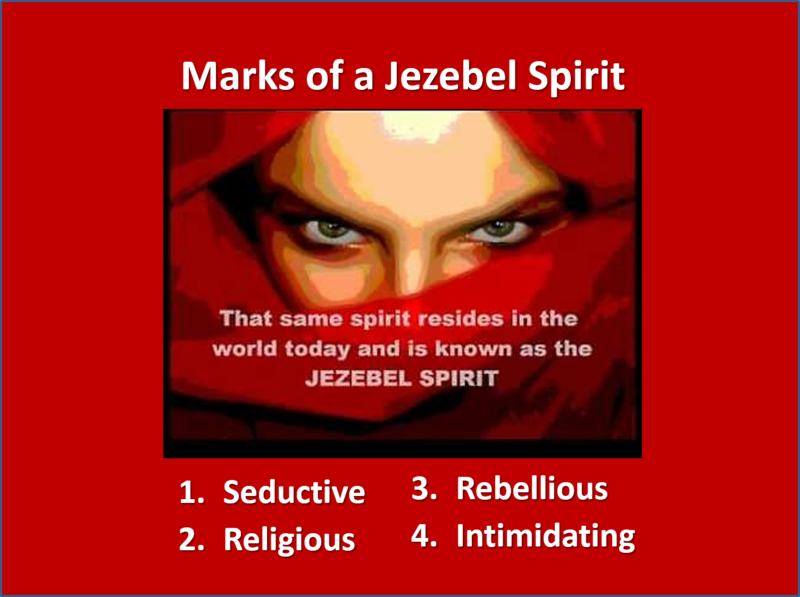 The # one demon at work in the church today is the Jezebel spirit. If Jezebel is operating in a woman, she will dress seductively in church or she will do whatever she has to, to get the pastor’s attention. A person dominated by this spirit will have a word of knowledge all the time and appear very spiritual. Once they have gained the pastor’s trust while operating with a familiar spirit, they will be allowed to prophesy over people. Never allow this person to lay hands on you in prayer. This is how defilement runs rapid in the church: innocent people who blindly follow whatever the pastor tells them, will come under major spiritual attack with witchcraft, oppression, strange illnesses and even death. Always ask the Holy Spirit first before you allow anyone to prophesy over you or to lay hands on you. The body of Christ needs to stop being “blind sheep” and have a close personal relationship with God so that we can heed the warnings the Holy Spirit gives us. It is usually in your personal prayer time that God will expose the Jezebel spirit at work in your church and you can pray for your pastor and leaders to not fall under her spell. Pray that your pastor will heed the warnings given to him. Some pastors who are warned about a Jezebel spirit operating in a woman will react out of the flesh. Instead of heeding the warning and taking it to prayer, he may feel bad about what was said about someone he knows. If he goes out of his way to be nice to this person, he may be stepping onto the snare that Jezebel has laid. Sadly, his good intentions backfire because he did not listen when he was warned and he may wind up being seduced by her. Once a Jezebel spirit is tolerated, many more people with this spirit will start attending the same church. It seems to be a spiritual law. When you tolerate Jezebel or compromise with it, this demon spirit will multiply in the church! I have watched this spirit manifest in many ways in the church. Once you have encountered this spirit, it is easier to spot each time. I have had many people with this spirit walk up to me and say the Holy Spirit told them they were to mentor me. I always giggle inside because while the devil can put on many different masks, he’s not really that creative. The Holy Spirit is my teacher and if the Lord has decided He wants me to be mentored by someone, He will reveal it to me first. Over the years, watching how this demon can influence both men and women, I have concluded that “everyone” may have some traits, or patterns of sin, which are related to the Jezebel spirit. When we commit these sins, it opens the door for a spirit to attach itself to us. If an attachment develops with a spirit of Jezebel, it is strengthened each time we commit her sins. Eventually we attribute these sins to part of our personality, "it is just who we are." This is when Jezebel is able to work through us for her purposes. If you are “on a bed of suffering” of sickness or pain that no prayer will deliver you from, there is a chance that you have unknowingly entertained a Jezebel spirit. If you have been prayed for and received healing for a time, but the sickness or pain returned, Jezebel may be in action in your life. We were all born with sin, so before we go on a witch hunt, looking for who has a Jezebel spirit, we need to be aware of her traits and examine ourselves first and "repent" for either entertaining Jezebel in our own life, or for submitting to it. In other words we must also make sure we have not been an Ahab. The key is to nip them in the bud so that this spirit has no chance to blossom in our life. Looking over the characteristics of Jezebel is a good place to start. If you don’t feel you have any of these traits, then ask someone close to you. A person who becomes infuriated when these traits are pointed out has this spirit already at work in their life. If you are irritated or offended by any of the things mentioned in this post, that is Jezebel trying to get you away from the thing that can reveal her and remove her from your life. Only a repentant heart will deliver you from the Jezebel spirit. By the way, this demon resides in the pituitary gland which is why it can take control over your mind and personality. Jezebel’s ultimate goal is to prevent us from living a life of holiness. She will do her best to defile us with fornication, sexual perversity, witchcraft, false teachings, and lead us to the wide path that keeps us in sin and away from a close walk with God. I ask you to forgive me for my tolerance of the Jezebel spirit and for being sympathetic to its ways. Please forgive me for every way I have opened myself up to this spirit. Help me to ruthlessly reject every type of this thinking as well as desire to control and manipulate other people. I turn from these sins and will do them no more with the help and aid of the Holy Spirit. I plead the blood over these sins and ask that You, Mighty Judge over Heaven and Earth, I ask you to overrule any cases in the Courts of Heaven that have given Jezebel access to me. The Courts of Heaven - Worldwide group has a policy that all administrators, and even those in training to help others with the Courts of Heaven, use this template after repenting for any of the sins in their lives. This is a zero tolerance policy toward Jezebel. If all churches and Christian organizations did this, Jezebel would no longer have a place within the Body of Christ. The Jezebel spirit must never be tolerated as stated in the book of Revelation. When you see your children manifest any traits, teach them to repent even at an early age because it grieves the Holy Spirit when we don’t teach our children in the ways of the Lord. This will help them to avoid being a victim of Jezebel later on in life. If you let someone with a Jezebel spirit influence you into doing something you shouldn't, it will give her a place in your life. There is so much that can be taught about this evil spirit but the key is to discern it in yourself first and repent and turn away from your sin. You do not want to wait until this becomes a charge against you in the Courts of Heaven. It’s better to confess a weakness to God before it gets rooted in your heart and the enemy has legal ground to attack you. If you would like help dealing with this spirit in your life, you can join us at our Facebook group where we connect the Body of Christ together or go to our website, and those with a gift of seeing in the Spirit will accompany you to the Courts of Heaven. Mention Jezebel in the notes sections when you make your 1st appointment. We know from experience that when you go to the Courts of Heaven and repent of the sin, the situation gets worse. The same applies here. We have had several people pray this prayer and experience backlash it is because some of the Jezebel traits are still in their life. You will need to look at the list and ask the Holy Spirit to reveal where her access is. A trip to the Courts of Heaven with a seer will also reveal what is allowing her access.